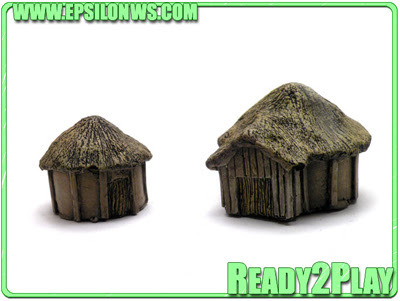 The range of 10mm pre-painted buildings available from Escenografia Epsilon has been expanding rapidly over the past year or so, and this month we've got a new pair of Dark Age round huts for you! These look great and could easily do duty in several other periods/genres as well, so should appeal to a lot of folks. These can be found in the Epsilon section of our website, along with all of their other great buildings: We'll have stock of all of these with us at the shows, starting with Claymore in August, then Border Reiver and Colours in September.